Usually, the only time you pay attention to your central heating is when a problem arises. But without central heating, you’ll have to bundle up in blankets to stay warm and put up with cold showers. Your central heating needs maintaining because it is a crucial element of any comfortable home. That is why it is important to know what is involved when heating your house. Central heating is a complex topic as there are many different types to choose from. Unfortunately, this complexity also means that finding exact pricing is difficult. The cost is comprised of many things. For example, the price for the actual equipment as well as labour and installation costs help to determine the final price. Also, your specific situation is important. 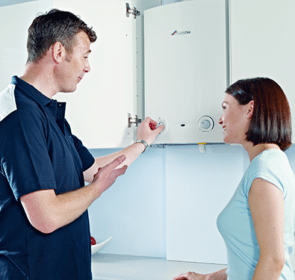 Simply replacing a boiler unit is cheaper than doing a complete overhaul of your central heating. To give you a better idea of what you’ll end up paying, here is a table detailing the average costs of central heating. How can you heat your home at the right price? Everyone wants a warm, cozy home, especially in those chilly winter months. However, this requires a balance between warmth and reasonable spending on energy. By taking your time to compare all of your options, you will be able to enjoy savings in the long run, all while keeping your home sufficiently warm. Use our quote request form to find a trusted heating company, who will supply you with the optimal equipment for your central heating. Have you been doing research on your central heating options, scoping out which system is right for you? There are so many choices to make, which might make you feel overwhelmed. With all the different ways to heat your home, this is understandable. 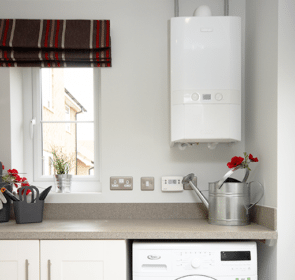 In this section, we have compiled the types of central heating available, along with the specific characteristics of each system to enable you to make the right choice. 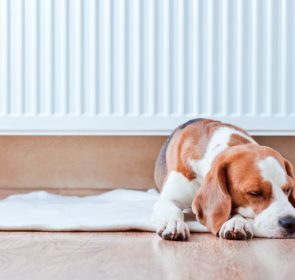 For warming your home, there are 3 kinds of heating available. These are a wet system, a warm air system, or storage heaters. A warm air system heats air via boiler, and pushes that warm air to ducts throughout your home. The air ducts provide space heating, while the boiler also warms water for use in taps. This type of system has dramatically declined in popularity in the UK, while it is still common in North America. A storage heating system involves electric storage heaters. These heat up overnight when electricity rates are lower, and release the heat throughout the day. Hot water is provided by other tools, such as a traditional boiler or immersion heater. A wet central heating system means you’ll be using a boiler. This can be further broken down into 3 different boiler types. A combi boiler, short for combination, heats water from the mains on demand and is made up of a single compact unit. It does not require additional water tanks. A conventional boiler is the traditional form of heating. The boiler heats water and pumps it to radiators for space heating and a water tank where it is kept for later use. A system boiler works in a similar fashion to a conventional one except that many components are built into the unit itself. As such, it requires less space. You will also have to choose which fuel you would like to use for your boiler. Gas is the cheapest, easiest, and most common way of powering a boiler. The gas is provided by your mains gas connection. Oil is the preferred choice for those without a gas connection. This involves regular oil deliveries which are stored in a separate oil storage tank. Electricity is another option. Using resistance, electric currents heat up water. Electricity, although relatively efficient and eco-friendly, is very expensive. LPG, or liquid petroleum gas, is similar to oil in that it must be stored at your home. However, LPG can also power your oven or hob. Coal, as a boiler fuel, is very rare. However, in some cases it is the only option, especially in rural areas. Biomass fuel consists of wood chips, pellets, or logs. It is more environmentally friendly than traditional fuels, but requires large amounts of biomass and boilers to provide the same amount of heat. Just like a car, your central heating needs regular tune-ups. If you neglect to service your central heating regularly, not only will its efficiency decrease but it can also become a safety hazard. Rather than put you, your home, and your family at risk, schedule regular maintenance for your heating system. 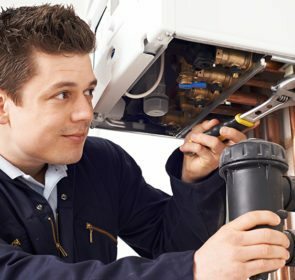 Central heating maintenance involves inspecting, repairing, and upgrading the various parts of your system. An efficient, high quality system should only require an annual service so you do not have to put too much effort towards maintenance. The most important task is a boiler service once a year. There are several tasks involved, some of which include visual inspection of boiler components, cleaning, and checks for carbon monoxide leaks. Another thing you should do to extend the life of your central heating system is to bleed your radiators. This removes air trapped in your radiator pipes, which creates cold spots. Visit our central heating radiators page to learn how to bleed radiators. Occasionally, take a look at the piping around your boiler and radiators along with your water storage tanks. Keep an eye out for irregularities, along with strange noises—a clanking noise could indicate limescale build-up. As highlighted above, there are many things to consider about your central heating. It’s difficult to make all of these choices on your own; instead, get help from a trusted professional. Vet the heating engineers in your area and save up to 40%. When you submit the quick form, you’ll get replies from 5 companies, enabling you to compare and find the right choice for you.